I’ve been reading through the Angry GM’s stuff, particular his megadungeon series, and couldn’t help but think about how his spreadsheets for encounters per level per dungeon section might line up with the various Pathfinder adventure paths. That led me down a thrilling couple of hours banging away at a giant spreadsheet of my own comparing the encounters in an AP to the various XP and wealth progressions. I’ll start off with the rules of thumb, and get into some wonkery explaining my work afterward. First off, the bad news: there’s no 1:1 enemy conversion available. There’s no way that 5e, with one Monster Manual, Volo’s, and a few other sources could approach the mass of opponent options in (at current count) six bestiaries, bonus monsters in every AP volume, multiple guides with NPCs, and the ability to attach class levels and templates to things. But even if they could, the math of 5e is just different for encounters than Pathfinder. For example, Pathfinder considers 12 zombies a level 6 encounter, while 5e considers them a level 5 encounter (and awards XP like a level 3 encounter, because 5e adds a difficulty premium for lots of monsters taking actions). So you’re going to have to basically rebuild every encounter in the AP with the closest equivalents (of existing monsters or ones you custom make) that meet a new XP target. But at least the math for doing so is relatively straightforward, since the expected encounters per level in Pathfinder is not that far off from the expectation in 5e. Most Pathfinder adventure path modules include a target CR at the start of every room or encounter, which may be made up of multiple enemies of lower CRs within the text itself. Simply rebuild the room as a medium encounter of that level. Remember to apply the correct multiplier for multiple opponents. Convert most magic items to their cash value (possibly as art) or consumables. Grant half of all of the cash (including that from converted items). For example, if the encounter has printed loot of 100 gp, 300 sp, and a 500 gp value item, it instead gives 50 gp, 150 sp, and a 250 gp value art object (or consumables). Only the most interesting magic items get converted to 5e equivalents. For those, try to give them a value equal to half their Pathfinder value based on the rarity values on page 135 of the 5e DMG. For example, a +3 equivalent shield is worth around 9,000 gp in Pathfinder, so gets translated to a strong Rare item or a weak Very Rare item in 5e (which, in this instance, checks out). While the XP awards keep 5e characters within spitting distance of Pathfinder characters, it’s not perfect. 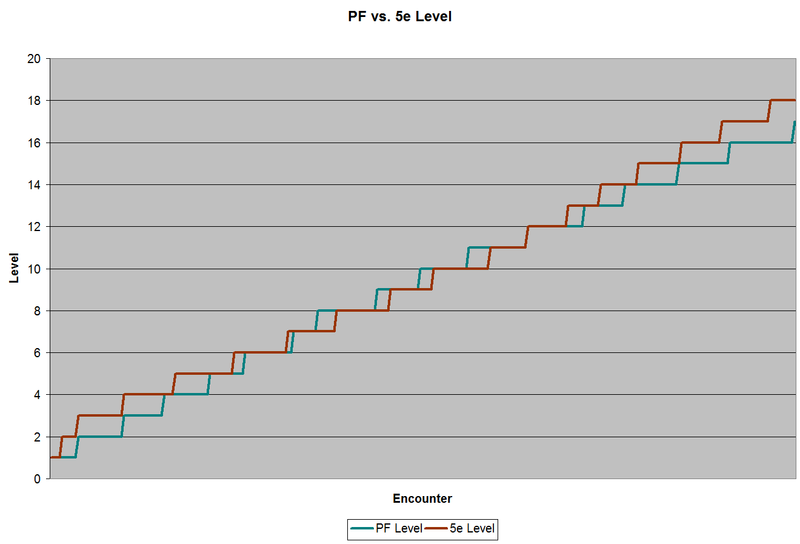 In particular, 5e‘s first two levels go by much faster than Pathfinder‘s, while fifth level lasts much longer. Player characters will hit 2nd level significantly sooner than the AP intends, and will hit 3rd level around the time the AP planned for them to hit 2nd level. They’ll be around a level ahead at all times until the module expects them to hit 5th level. At that point, it starts to swing a little bit, but the PCs will usually be a few encounters behind where the AP expects them to be until 12th level. They hit 12th level at pretty close to the exact right spot, then are close to in sync for the next couple of levels. They pull ahead at 15th, and will pull further and further ahead as time goes on, to the point of hitting 20th level when a Pathfinder character would be early in 18th level. For most APs this won’t matter much, but you might want to pull back encounter budgets further past 15th level (or feel more free to skip non-plot-critical encounters). I made a long sheet with every encounter from the Mummy’s Mask AP, with a running total of XP per party member (for a four member-party) and a level lookup to make sure that the awards tracked where the modules suggested they should be. They did, and were usually pretty damned precise (almost as if the APs are created by carving up each level as an XP budget for each section of each module…). Initially, I looked at just handing out 2/3 of the Pathfinder budget for each encounter, and that tracked as well or better until 10th level, when the XP charts diverge too much. Converting the encounter’s CR from the module to an equivalent 5e encounter somewhere between Easy and Medium created the best correspondence with the easiest-to-remember and process rule of thumb. By just targeting Medium, but assuming that there will be an overall loss of XP because of the difficulty multiplier for multiple enemies, it should be easy to remember how to convert without having to do any averaging yourself. For treasure, I did a much less thorough comparison, and just looked at the stated Pathfinder wealth by level compared to the expected cash equivalent 5e income derived in this thread. I noted the suggested starting magic items for higher-level characters on page 38 of the DMG, and assumed those were relatively close to what you’d be expected to find in play, adding their value to the cash totals (it winds up only counting for about 15%). The comparison of Pathfinder to 5e wealth has a ton of swing in it, but it gets pretty close to 50% for the last two tiers. Functionally, for the first tier the PCs will find a lot more wealth than the DMG expects (since Pathfinder frontloads more treasure), but there shouldn’t be a big enough difference by 7th level to justify a more complicated method of recalculating the AP’s treasure. It’s already going to be annoying enough to look up the value of minor magic items to turn them into cash prizes. Since I didn’t look super deeply at how the APs award magic items, I imagine that figuring out what to convert to cash and what to replace with a 5e equivalent will be more art than science. It would be reasonable to model Captain America’s superpowers (from certain eras and writers) as just “human max attributes.” In D&D/Pathfinder, that’s 18s (or maybe 20s) in all six ability scores. While I have my misgivings about the fungibility of the race features in the Advanced Race Guide*, I couldn’t help but notice that the point scales involved in race building seemed fairly similar to the points used to buy ability scores. In particular, I wondered if it would be fair to do something like allow a player to be an aasimar (a 15 point race) in a party of players handbook races (9-10 point races) in exchange for the aasimar PC having 5 fewer points for ability scores. Those ideas gelling in my head, I did do some additional math and found out that, indeed, the race point balancing is relatively close to ability point balancing. To wit, if you made a PC with all 18s it would cost around 90 ability or race points (not counting the first 15 points that normal characters get); for race points, it’s using the +2 ability score bonus with no strings that increases in cost for each cumulative +2. The price is likewise similar (around 130) for all 20s. Since the math is close enough, let’s move on to the system below. You can turn Pathfinder into a supers system by just giving out bonus points that can be spent on ability scores or racial features. A character of around Captain America’s power level gets 100 or so points. Notably, these characters will be hella awesome for first level characters, but scale normally through character level (and mythic tiers, if you’re feeling particularly gonzo). Character points can be spent in three major ways: enhanced ability scores, racial features, or spell-like abilities. While the normal point buy rules stop players from buying over 18, it’s easy to extend the costs indefinitely upward: the cost for each ability score increase is equal to the modifier for that score (e.g., it costs 5 points beyond the cost of 19 to get to 20, because 20 grants +5). So someone that had 100 points and went all in on an ability score could start with a 30 or better. Most of the racial features from creating new races (p. 215 of the ARG or here) are probably viable for building heroic abilities. Hell, you need a pile of superhero points to afford to be a robot (sorry, “construct”). Specifically, leave out the racial features that modify ability scores (use the point costs above) or grant one-off spell-like abilities (see below). Otherwise, anything the GM and player agree works for the character’s power concept should be fair game for the prices listed. The real bread-and-butter of making supers is the freedom to pick spells to use as spell-like abilities. Want to be a blaster? You can do worse than Scorching Ray. A teleporter? Dimension Door. The costs in the ARG seem relatively cheap for this purpose, though: it makes more sense to sell players a second level spell per day for 2 points when they’re going to have less than a dozen points, but that’s a LOT of scorching rays if you have 100 points to spend. You can also work out with the player how many uses are required for something to become an At Will spell-like ability, or an always-on supernatural ability. For attacks and other primarily-in-combat powers, I’d work out how many times I genuinely expect the player to use it in a day, and make it At Will once that many uses are purchased. For utility abilities, particularly long-duration ones, it may only take a few per day to become a self-only, always-on supernatural ability. Healing and other things that become really good out of combat with unlimited time should probably never become At Will. Like racial spell likes, the caster level for these abilities is equal to total character level/hit dice, and the save DC is equal to 10 + spell level + the most relevant ability score modifier (but don’t let the player browbeat you into setting the save DC to the ability score he’s raised to a crazy high level if that doesn’t actually make sense). And with all of that, you’ve hacked in superheroes. Either turn them loose on the normal fantasy classes and setting, or strip down the core classes to run something more traditional for supers. Facing is admittedly complicated. Third edition D&D removed it, and subsequent editions haven’t seemed to have cause to question that decision. Particularly in the already tactically dense 3e and 4e, tracking facing would be another complication on top of a bunch of other rules that could slow down play. But Attacks of Opportunity, flanking, and the rules for the Stealth skill are also complicated. I’ve often wondered whether the complexity saved by removing facing really saved much effort after the rules that had to be put in to preserve some level of simulation. During combat, each character is always considered to be facing in a particular direction. 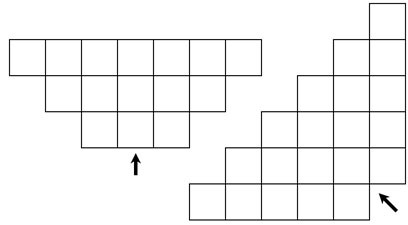 On a grid, the facing is always centered in the direction of one of the eight adjacent squares. The character’s total facing is essentially a cone covering the square in the center and the nearest two other adjacent squares (see diagram). A character making a move action is normally considered to be facing in the direction of travel while moving. If a character wishes to specify facing from square to square while moving (e.g., to keep from turning her back on a target while moving away or past), the character moves at half speed for that move action. While stationary, on her turn, a character may choose any facing desired (e.g., you can make an attack against a character on one side of you and then make your next attack against someone on the other side). A character must pick a final facing upon ending her turn. A character may also change facing during any other character’s move action in order to center facing on the moving character (i.e., you can always turn to face someone who’s moving to keep them from moving around behind you). However, you can’t turn when another character takes a non-move action (so be careful if you turn to face a target when that target’s ally is already adjacent to you). You also must be aware of the other character to turn to face her (see Stealth, below). You can generally only make an attack on a square within your facing (as noted, you can change facing at will on your turn). Attacks against a target from squares not covered by that target’s facing count as flanking (gaining a +2 bonus and Sneak Attack). This applies whether or not there is another ally involved and works with melee or ranged attacks (do not turn your back on a rogue archer). You can use the Stealth skill as if you had concealment if none of your enemies have you within their facing. That is to say, a character using Stealth may use it to move from cover to cover if no enemy is facing in a way that covers her path, and may use Stealth to get behind a target and make a Sneak Attack, even while combat is ongoing. It’s a bit of a busy Memorial Day weekend, so I hope you’ll enjoy some setting notes I put together for an upcoming Pathfinder game in lieu of a systems post I didn’t have the time to write this week. To the elder races, the time when the old gods walked the world is still within living memory. To the younger races, it is the distant past. Nonetheless, all histories agree that there was an epoch when gods were flesh. When gods demanded that all participate in their great works, whether they wished it or not. The line between the old gods and various other powerful entities from the cosmos is blurry, though scholars tend to split the difference at agendas: demon lords and the like share a nature and a mandate with an unearthly realm, while each of the old gods seemed to have his or her own unique goals, petty though they might have been. Some were more agreeable than others. And, in the beginning, each of them gathered a following of mortals, if for nothing else than support against enemies. But those that were content to protect and rule were outnumbered by those with a towering need to reorder the world. Their conflict etched the world into the state it is in, even today. Eventually, it became too much. Mortals sought out new gods that were less present. Entities that were more concept than flesh, with no need to reshape the world on a whim. Many believe calling them the “new” gods is a fundamental error; they were always here, but the arrival of the “old” gods temporarily blinded the world to the protectors that had always been among them. Nonetheless, the old gods could not contend with an uprising of mortals backed by gods that had no physical forms to slay, no presence to fight directly against. Over eras, the old gods were defeated and killed. The new gods are quieter, on the whole, content to lend power to their clerics and allow the churches of different nations to color their worship. Some are all but silent, and many prophets claim to speak for them, causing schisms. But the worst of these holy wars is but a simple disagreement compared to the war of the old gods. There are four gods that are openly worshiped, and two others that few will admit to worshiping directly (or even believe exist). Known by many names, each agrees on one salient attribute: the Sun knows everything upon which its light falls. As the Sun is also extremely fond of life and justice, those that mean ill to their fellow mortals must make their plans in darkness, lest agents of the Sun stop them before they have even begun. However, despite its essential light and strong gifts given to its clerics, the Sun seems unable or unwilling to intervene directly through a show of force. It is also hard to commune with: sometimes, at great need, it gives visions or omens to the faithful to seek out an unfolding ill, but otherwise only clerics with strong magics may communicate with their god. Few can agree whether Nature is the planet herself, or merely the ecosystems that lay upon her. Whatever the answer, Nature is unafraid to act: from titanic natural disasters to fortuitous shifts in the wind, the roused god can alter many things. It seems deeply aware of all that happens within its domain, as well, as many disasters eventually reveal a problem mortals were unaware of. This brute-force problem-solving is important, because it is the only way Nature communicates. Any who claim to have gotten a direct message from the god, even its powerful clerics, are understood to be liars. Fortunately, Nature seems to have a mild benevolence; scholars that have done studies tend to find that the innocent are spared much more often than the guilty by the chaos of the natural world. The most esoteric of the four openly worshiped gods, each culture places its own stamp on Progress: to some, she is an artist or a freedom fighter, and to others, he is a smith or an engineer. All agree that, of all the gods, Progress is the one most inclined to work to see mortals succeed and grow. Helpfully, Progress is also free with communion and visions, often granted as dreams or just flashes of inspiration. Unfortunately, Progress is limited in ability to act in the world and almost totally blind to what’s going on but for what its priests tell it. Minor miracles of enhanced creation can sometimes emerge as a response to prayer, but otherwise the world’s progress is unevenly and very inefficiently distributed… almost as if the god is distributing inspiration entirely at random. The world is flooded with prophecy. Many speculate that these are merely messages from Fate about things the goddess (often rendered in triple-form by various cultures) would like to see enacted, and will back with divine potence. Others wonder how you’d tell the difference between seeing the future and using divine might to cause it. Most believe that Fate is blind to the present, and only able to see the world that may be. Even Fate’s priests also agree that she is the god with the least interest in helping mortals: what will be, will be, whether or not it rewards the virtuous and punishes the guilty. Some postulate that there must be a new god responsible for all the conflict that still exists in the world after the death of the old gods. Brutal, uncivilized cultures often seem to field clerics with access to powers different from the followers of the four primary gods, but these may be awarded by the remnants of old gods or demon lords. Meanwhile, another force is often invented to explain why civilized society often seems to break down from within, despite the best efforts of Progress. It’s hard to be certain whether the leaders of debauched mystery cults are truly clerics of such a deity, or draw their powers from the remnants of old gods or hellish princes.